So, I'm still trying to master the art of pancakes. 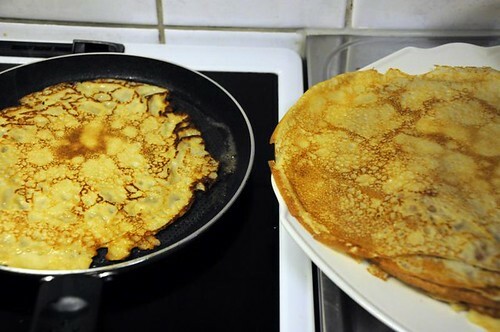 Swedish pancakes - thin ones, the size of a frying pan. We eat them with jam, some people add whipped cream as well, but I find that puts them firmly in dessert territory, and I like them as actual dinner. These photos show my new pancake pan - it's a little smaller than my other pans, very non-stick, and with short sides to make the flipping easier. I still can't flip pancakes in the air - definitely not - but this still makes frying pancakes a lot easier. The trick to good pancakes? Lots of butter. When I make pancakes for just me and Titus, we end up with lots of leftovers. So, that means we can eat crêpes! Crêpes are basically filled pancakes, and I like to fill them with a thick mushroom stew. Delicious! Fry the bacon until it starts to crisp up. Add the mushrooms and onion, and fry until the mushrooms lose most of their liquid. Mix in the flour. Gradually add milk and cream, stirring all the while, and season with worcestershiresauce, cognac, salt and pepper. You might need more flour (in which case you need to whisk it with some liquid beforehand), or more milk, to thicken or thin the stew to your liking. 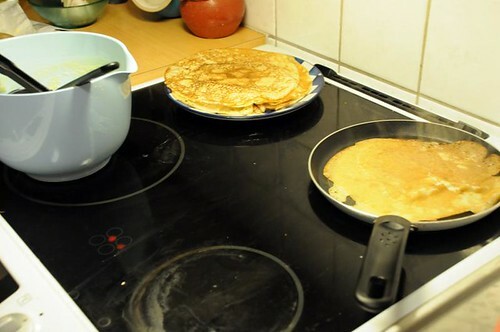 Fill the pancakes, roll up and place, seam-side down - in a snug oven-proof dish. Sprinkle with a little sharp cheese, and gratinate at 225°C for 8-10 minutes. I ate pancakes with banana, Nutella, and bacon last night. I suppose that makes it dessert. But BnB pancakes are stuff of LEGENDS! I love your new pancake pan! Looks fantastic to use! Mmmmm I love mushroom crepes, but I have never used bacon or w-sauce when cooking it. Sounds delicious! What cheese do you usually use?Sharp Cheddar?Or some local one? Tora, that sounds so yummy!! Fahad, I use a local one called Västerbottensost, but a sharp cheddar would absolutely work very well!